Well, well, well… OIL well, that is! 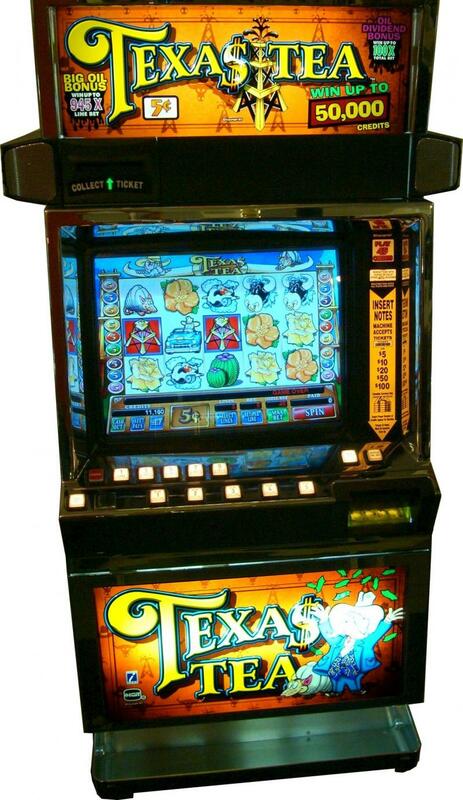 Texas Tea Video Slots is a gusher of entertainment with barrels of bonus game action that’ll keep the handles pumpin’. With each spin of this 5-reel, 9-line rig, you are treated to a musical score so richly orchestrated you'll feel the sky’s the limit. Texas-style graphics include the Yellow Rose, Blue Bonnet, Buttercup and Barrel Cactus flowers. Animated symbols add to the action with comical characters such as oil tycoon Texas Ted, his Armadillo, a Texas bull, and status symbols like a corporate jet and a classic Longhorn Cadillac. Three or more Texas Ted scatter symbols initiate the "Oil Dividend" bonus. In this animated scene, Ted writes a "dividend check" that floats to you while displaying a credit award. The "Big Oil" bonus starts when three or more oil derrick symbols land adjacent on a payline. You know you're in for some action as the game screen shakes and rumbles, and oil oozes over the screen. The bonus unfolds, revealing an outline of Texas divided into eight regions. Ted prompts you to place an oil derrick on a region, up to the number of symbols initiating the bonus. When the last one has been placed, each derrick pumps oil. The more oil pumped, the more credits are awarded. Texas Tea®Video Slots is erupting with fun that’ll have y'all drillin’ for more!